AAPL buyers are in hyperdrive, capable of dragging the broad averages higher not only in the days ahead, but quite possibly until New Year’s. 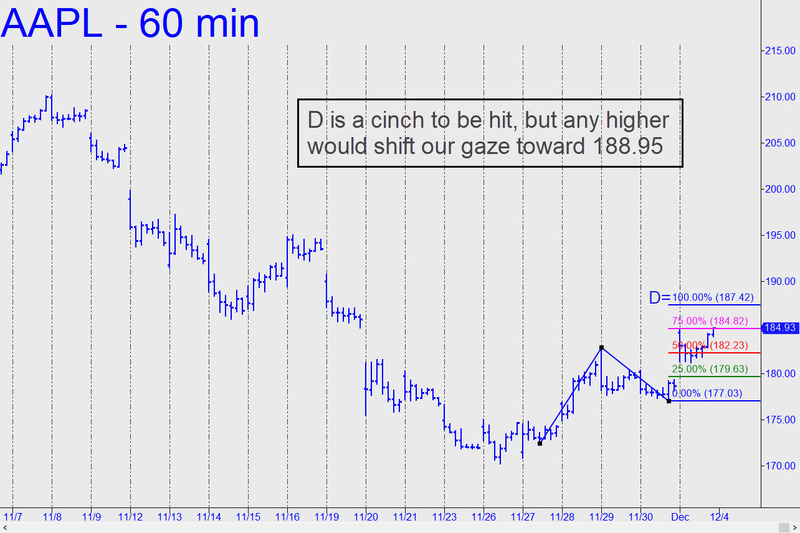 The stock is bound most immediately for the 187.42 target shown (see inset), but any higher would put an alternative target at 188.95 in play. These targets are useful for trading purposes, but also for analysis. A decisive move past the lower number would put the higher in play. If it too is exceeded, that would be a sign that the uptrend is likely to continue, possibly after a tradeable retracement. As I have emphasized here repeatedly, as long as AAPL is moving higher the broad averages will continue to do so as well. That is why we should pay very close attention to the way the stock interacts with the two Hidden Pivot resistance points noted above. Rendre la France grande encore! I will be waiting with hopeful anticipation to see what happens in France this coming Sunday! And it’s about time too!